The Conservative Prime Minister, Margaret Thatcher, won an historic third term in office in 1987. As the election approached, the Government had successfully put the industrial disputes of the miners and printworkers strikes behind them. Cabinet resignations due to the Westland affair, which had rocked the Government the previous year, also seemed to be forgotten. The economy was booming once again. Despite a revitalised Labour Party under the leadership of Neil Kinnock, Mrs Thatcher was returned to office with a majority of 102 MPs. She could now look forward to governing into the 1990s, and some commentators began to wonder if Labour could ever be returned to office. 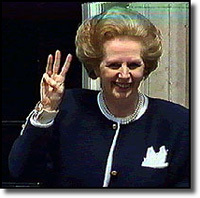 The second term of Conservative Prime Minister Margaret Thatcher was not without its crises. Two long and bitter strikes, firstly with the miners in 1984-1985 and secondly with the printworkers at Wapping in 1985-1986, tested the strength of Mrs Thatcher's government. Both strikes proved extremely divisive, but the government and its allies emerged victorious from both. In 1986, the Government faced a greater threat to its stability and integrity when two Cabinet ministers, Michael Heseltine and Leon Brittan, resigned. Their resignations came over the Westland affair. Superficially, it was an intra-governmental squabble over funding for a troubled British helicopter manufacturer, but Heseltine labelled it as " a breakdown of constitutional government". The Labour Party was in better shape than in 1983. Neil Kinnock had replaced Michael Foot as leader and halted the party's leftward drift, moving it back towards the centre. Labour, however, was still suffering from the challenge posed to it as Britain's main centre-left party by the SDP-Liberal Alliance. In opinion polls, the Alliance had cut Labour's lead over it to single figures and had also scored a notable victory over Labour in the Greenwich by-election of February 1987. When Mrs Thatcher announced the next election for 11 June 1987, she was confident that the Government had left its troubles behind. Local elections proved the Government's strength, and the Conservatives were helped no doubt by a solid economy, falling unemployment and low inflation. As campaigning began, opinion polls showed the Conservatives on 43%, Labour on 29% and the SDP-Liberal Alliance on 26%. The Conservative Party benefited from the three-party split, but suffered from a few internal divisions. The Conservatives' campaign, although apparently going smoothly in public, was troubled. A week before election day, on what was to become known as "Wobbly Thursday", a rogue poll for The Daily Telegraph showed the Tory lead down to 4%. A concerned Mrs Thatcher handed the management of the campaign over to advertising guru Tim Bell. In a blanket newspaper advertising campaign, Bell spent �2 million in a single week. The Tory message was simple: "Britain is great again. Don't let Labour wreck it". Mrs Thatcher was regarded by some Tories as a handicap in election campaigns and she made several errors in 1987. Her first, an announcement that she intended to "go on and on", worried some voters, as did her suggestion that fee-paying could be introduced into state education. Her biggest gaffe did little to help her uncaring reputation. When discussing private health care, she remarked that she wanted to be able to enter hospital when "I want, at the time I want and with the doctor I want. . . I exercise my right as a free citizen to spend my money in my own way." Labour's campaign, run by Bryan Gould and Peter Mandelson, was by comparison slick and professional. 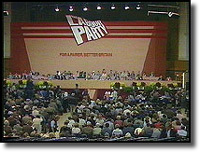 The party denied it was running a presidential campaign, although Neil Kinnock featured in nearly all party broadcasts and press conferences. The showpiece of the campaign was a party political broadcast by film director Hugh Hudson. The broadcast showed Kinnock and his wife Glenys walking on a coastal path with the sound provided by a recent Kinnock speech. It became known as the "The first Kinnock in a thousand generations..", broadcast because of his reference to himself as being the first-ever member of his family to go to university. The broadcast did a great deal to improve the Labour leader's image, which had been one of the party's weak points. The Conservatives were both quick and effective on the attack and Labour presented them with several clear opportunities. Confusion over Labour's defence policy led to a Tory poster campaign showing a British soldier surrendering with his hands above his head, under the legend: "Labour's Policy on Arms". Denis Healey also suffered at the hands of the Tories when it was revealed his wife had once used private health care. When the subject was raised by television presenter Anne Diamond, Healey simply refused to comment and stormed off the TV-AM set. The Tories also attacked Labour where it was the most vulnerable - on tax. The Secretary to the Treasury, John MacGregor, costed Labour's election proposals at �35 billion in extra spending and the Chancellor, Nigel Lawson, argued that this would mean an income tax of 58% or VAT of 50%. Eventually, Bryan Gould was forced to admit that the top 5% of earners would be hit by Labour tax plans. David Owen and David Steel led the Alliance's "Britain united" campaign and held "Ask the Alliance" evening meetings, although most of the coverage of their campaign focussed on the problems caused by their co-leadership of the Alliance. The biggest area of doubt was over which of the main two parties would be preferable allies in a hung Parliament. Dr Owen discounted the chances of the Alliance joining with Labour, while Mr Steel made similar comments regarding the Conservatives. However, the two continued to criss-cross the country in their individual "battle buses", trying to garner as much support as possible. As polling day approached, opinion polls showed the Conservatives seven points ahead of Labour with the Alliance trailing in third place. As predicted by the polls, Mrs Thatcher was returned for an historic third term, albeit with a reduced majority of 102 seats, down from 144. Overall there was a 1.2% swing to Labour. Labour increased its number of seats from 209 to 229 and did particularly well in Scotland and the north of England. The Alliance polled 23% of the vote but finished with only 22 seats, one seat down on 1983. The party also lost the leading figures of Roy Jenkins and Clement Freud. Mrs Thatcher had become the first prime minister since the 1820s to win three successive election victories. With a majority in excess of a 100 seats, she looked certain to govern Britain until the end of the decade. Labour continued to be tortured by the question: would it ever be returned to office?